Most of us, of course, never want our Scouting adventure to end. But sometimes, a Scout outgrows a uniform, or a long-time Scouter decides to part with some of the memorabilia she or he has collected over the years, or possibly, a troop or pack loses its chartering organization and is disbanded. So what is the right thing to do with uniforms, troop flags, extra badges, and other Scouting memorabilia? While you can certainly donate uniforms to a local thrift store, try finding a Scout who you could donate the uniform directly to. Find a nearby pack or troop. Find out if they have a way to share used uniforms with their Scouts who need one. Well-organized units most always will. Ask if your local Order of the Arrow lodge has a uniform bank. The OA can reach out to local troops for you as a part of their service to units. Drop off at the local Scout Office. Someone there will be happy to get them to Scouts in need. These are officially produced items and are hard to repurpose. There is always a way to display and use old flags. So don’t toss them out! Give to a Scouter or family that has played a key role in the life of your troop or pack. Give to the local council for their historic preservation effort. 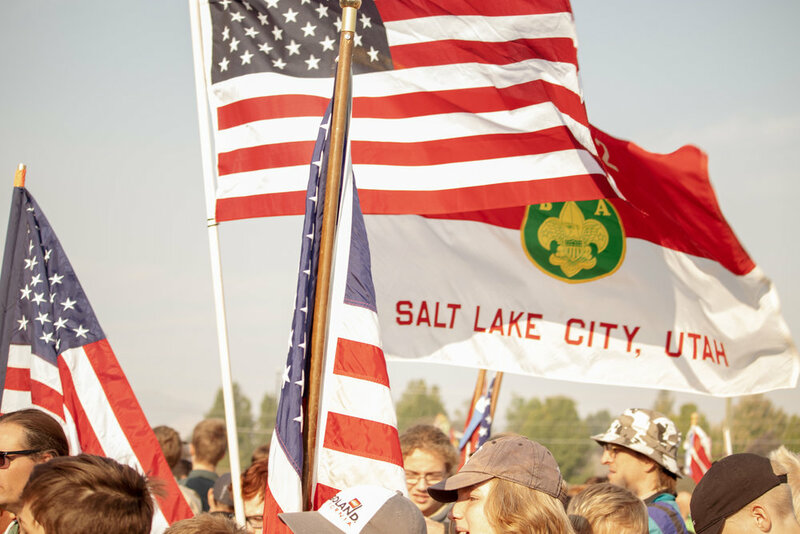 A lot of ward troops have had a “flag fundraiser” in which Scouts collect money and put flags up in their neighbors’ yards on national holidays. Many ward troops will no longer do that fundraiser. Here are some ideas for what to do with your flags. Hold a flag sale. Take flyers door to door in your neighborhood and invite neighbors to a one-day event to sell all of your flags. Set up all of your flags in a grassy area where neighbors can come and choose their flag, kind of like a Christmas tree lot. Since the better flags are likely to go first, you can have a start price that you lower every couple of hours until the flags are all gone. Remind everyone it’s for a good cause (to fund one last summer camp as a ward troop)! Have one last year of holidays. Do the same thing you have done for the flag fundraiser, but let people know they will keep their flag at the end of the year. Might end up with some folks who are unhappy with the flag they get, though. Donate them to the Order of the Arrow. They can use them for a flag fundraiser of their own or find a new troop that needs a flag. You might have bought awards that were never awarded. Try one more time. Even if a Scout has aged out of your program, they still might appreciate getting a patch he earned and never received. Find a nearby pack or troop. Starting a new unit can be expensive. It’s nice to have some spare awards that are ready to go when Scouts earn them. Drop off at the local Scout Office. Someone there will be happy to get them to units who can use them. Folks everywhere love Scouting. One way they may express that is in having a collection of patches, pins and other memorabilia. Some even collect whole uniforms! Ask if your local Order of the Arrow lodge has an upcoming memorabilia auction. The OA provides lots of activities and events to help Scouts develop leadership skills, provide service, and have even more fun in Scouting. A memorabilia auction is part of how they fund their excellent programs. Drop off at the local Scout Office. Someone there will be happy to get them to Scouts in need or incorporate them into a fundraiser auction. As you can see, there is always a way to find a good home for used Scouting stuff. Everything about Scouting is made to last, so make sure you pay it forward to the next generation of Scouts! To find out about DIY projects that you can do with many of the things mentioned above, head on over to our Pinterest to check many cool ideas that we like. This exciting event will give your Scouts to opportunity to interact within certain fields of study while working towards completing a merit badge.